A Dutch court has ordered the government to cut greenhouse gas emissions by at least 25% by 2020, in a case environmentalists hope will set a precedent for other countries. Campaigners brought the case on behalf of almost 900 Dutch citizens. They argued the government had a legal obligation to protect its citizens from the dangers of climate change. Government lawyers did not immediately comment on the ruling at the court in The Hague. Jasper Teulings from Greenpeace called it a “landmark case”. The court ruled that based on current policy, the Netherlands would only achieve a 17% reduction at most in 2020, which is less than other nations. “The parties agree that the severity and magnitude of climate change make it necessary to take measures to reduce greenhouse gas emissions,” it said. 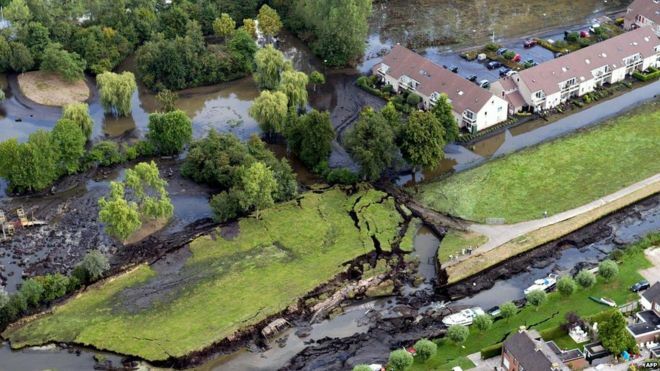 The lawsuit was brought under human rights laws by the sustainability foundation Urgenda, which said – and the court agreed – that the Netherlands had a duty of care to its citizens and to improve the environment. It argued that unless rapid action was taken, the next half of this century would see extreme weather, shrinking ice caps and shortages of food and water. Low-lying Netherlands is especially vulnerable, and must now cut its emissions by a quarter compared with 1990 levels. The targets will require tough action, says the BBC’s environment correspondent Helen Briggs. Coal and gas provide much of the Netherlands’ energy needs, with the country lagging behind neighbours Denmark and Germany in the use of renewables, our correspondent adds. The Dutch government can appeal to a higher court and it is not clear yet how the ruling will be enforced. The European Union recently set a target of reducing emissions by 40% by 2030. A major conference on climate change is due later this year, with negotiators aiming to strike a global deal limiting temperature increases to no more than two degrees over pre-industrial levels. The judgment was unprecedented in Europe, and unexpected. It pushes the Dutch government to honour its commitment to cut emissions. In terms of the practical implementation, the government has already agreed to close coal plants, increase the use of windmills and solar energy and drastically reduce gas extractions in the north of the country. The court case puts pressure on the government to speed up the process in order to meet the targets and become more energy efficient within the next five years. The judgment is legally binding, and based on “Tort Law” – a general and universal concept which essentially refers to a duty to refrain from causing harm.